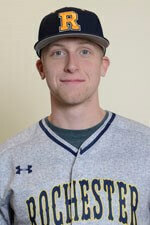 Playing in Division III and in the raw Northeast spring, University of Rochester baseball is not a traditional hotbed. Nonetheless, over the years the program has produced noteworthy standouts, including Tom Havens ’91 who donated funds for the Tom Havens ’91 Towers Field scoreboard. 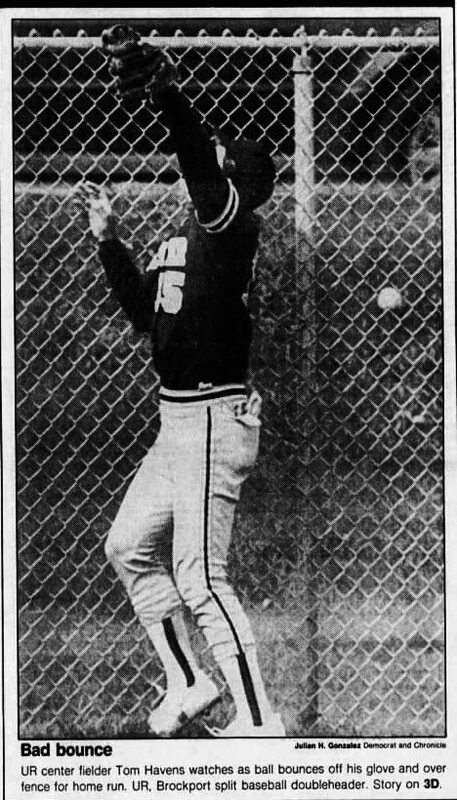 Recently, pitcher John Ghyzel, chosen by the Cincinnati Reds in the 18th round, became only the second Yellowjacket to be drafted by a major league team, joining Michael Weiermiller in 1981. In Ghyzel progresses to the pros (UR Campus Times), Sports Editor Trevor Whitestone follows John’s career from a freshman with a “live arm” whose mechanics needed honing to a major league prospect with a fastball peaking at 99 mph. Under the tutelage of Coach Joe Reina, each season John advanced: from a first season ERA of 5.45 to holding opponents in his junior year to a .232 batting average. 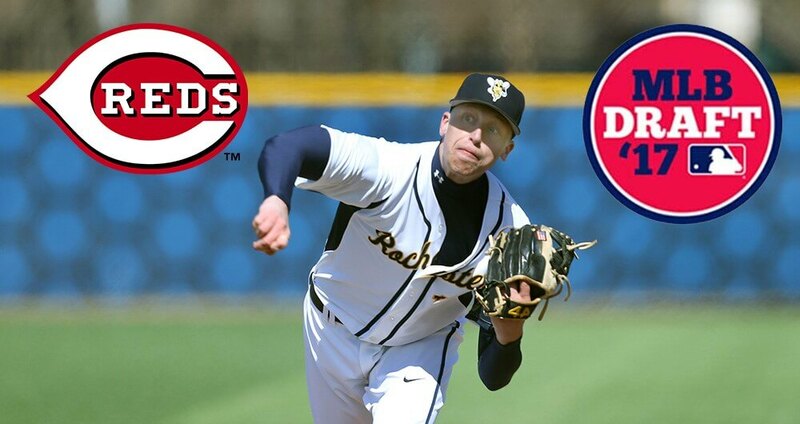 John Ghyzel selected by Reds in 2017 Major League Draft (Univeristy of Rocheste Athetics). According to redlegsbaseball.com, Ghyzel signed for @83,000. At a 2017, Memorial Day weekend pro workout, Ghyzel opened the eyes of scouts with his elite velocity, ultimately leading to his drafting by the Cincinnati, pitching his first game on June 28, 2017 for the Arizona League Reds. In the minors John has been progressively improving. 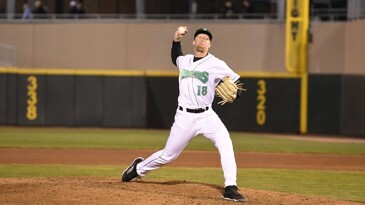 In 2018, John recorded 19 saves for the Dayton Dragons of the Class A Midwest League and made the Eastern Division All-Star team. (left) Boxscore from John’s 5th save, Quad-City Times (Davenport, Iowa), 05, May, 2018; (right) John named to the Midwest League’s Eastern Division All Star team, Quad-City Times, 07, Jun, 2018. While — according to Baseball Almanac — no Yellowjacket has ever played in the major leagues, John may well be the first. Already, he’s eclipsed the minor league career of Tom Havens. 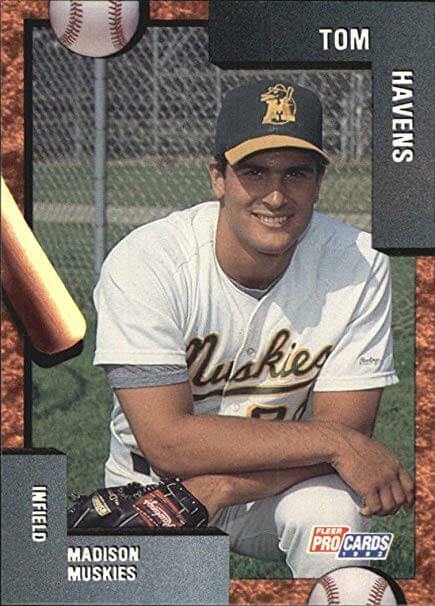 Not drafted, Havens signed with the Oakland A’s in October 1991 and played one season for the now-defunct Madison Muskies of the Class A Midwest League. 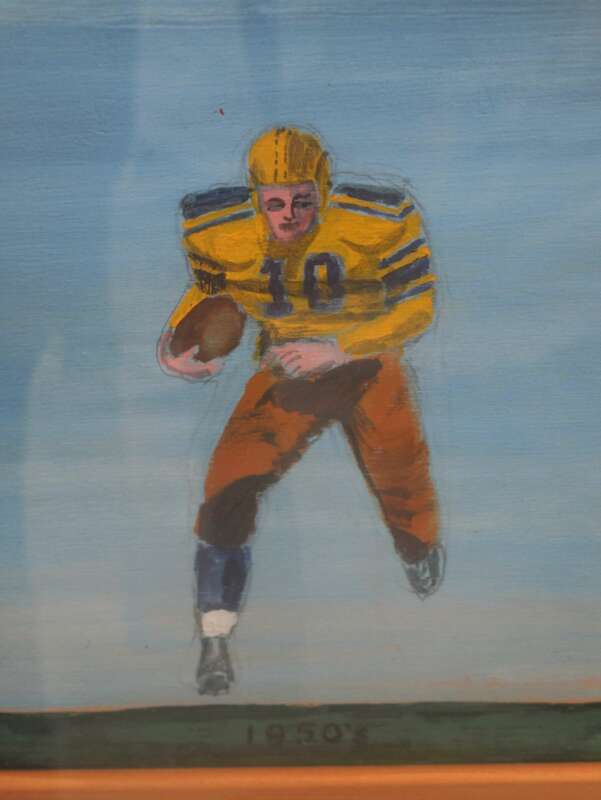 Nonetheless, Tom may have had the greatest collegiate career of any Yellowjacket. During his storied career, Tom was as a four-year starter in centerfield from 1988-1991, named MVP of the Hall of Fame Tournament 1989-1990, three-time ECAC Upstate NY All-Star Team, three-time All-UAA team, two-time First team All-Northeast, first team Division III, American Baseball Coaches Association First Team All-America, 1991 NCAA Division III Batting Champion with an .541 average, ranks first for UR all-time in home runs (33) and RBIs (157), ranks second all-time in hits (191) and runs scored (151) and third all-time in batting average (.400) and in 1991 set single season records in batting average (.541), RBIs (54), slugging % (1.063), and total bases (118). I especially remember Tom because in his senior year, 1991, I was taking graduate courses at the University of Rochester. There was a palpable buzz at Towers Field as baseball fans watched Tom reached the astronomical heights of a .541 batting average. 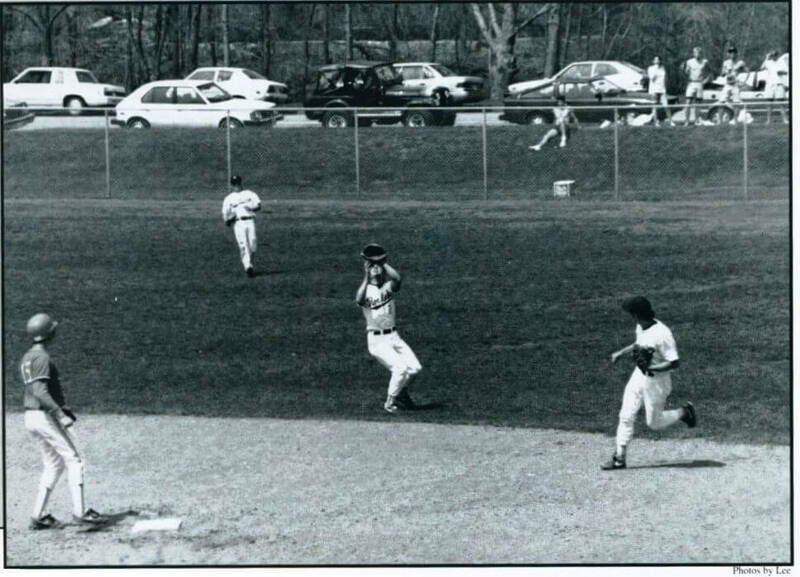 Set below the dorms (hence Towers Field), the diamond is nestled, saucer-like, at the base of the slopes where fans can enjoy a fine view with the Genesee River glinting in the distance. A while back, a bright green artificial surface was installed, allowing for true hops, crisp play and an emphasis on speed. 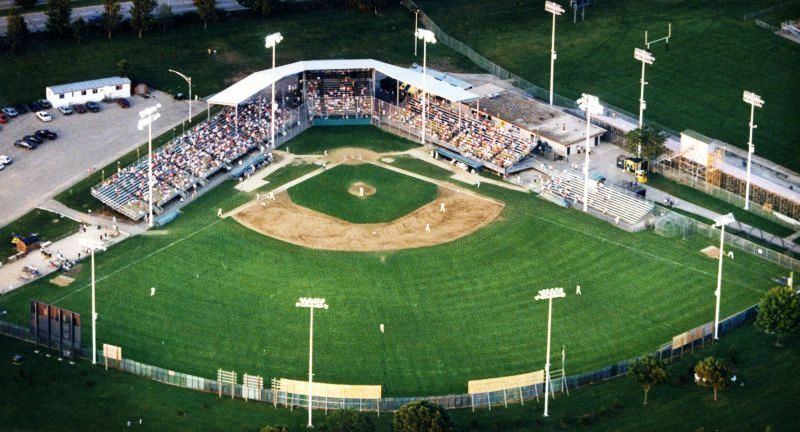 As seen in Over 10,000 fungos later, for decades my friends and I would hit fungos on Fauver Stadium’s artificial turf and then take batting and infield practice at the then-real grass of Towers. I distinctly remember one bright Saturday in May 1991 when I took a break from the library to join hundreds in watching parts of a doubleheader in which Tom and company swept Union. 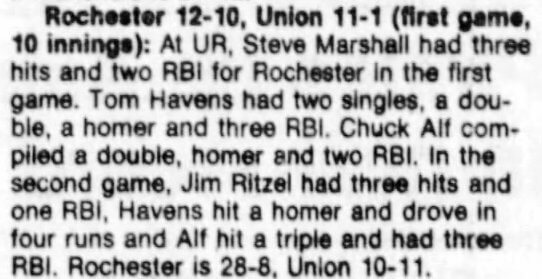 By sheer coincidence, after leaving the University of Rochester Tom and I both were in Madison, Wisconsin: Tom as an outfielder/third baseman for the Muskies and myself as an English Master’s Degree candidate at UW. The Muskies only existed for 11 years and Tom would play in their second to last season. In their time, the Muskies produced several successful prospects for their home team the A’s, including Jose Canseco, Terry Steinbach, Scott Brosius and Walt Weiss. 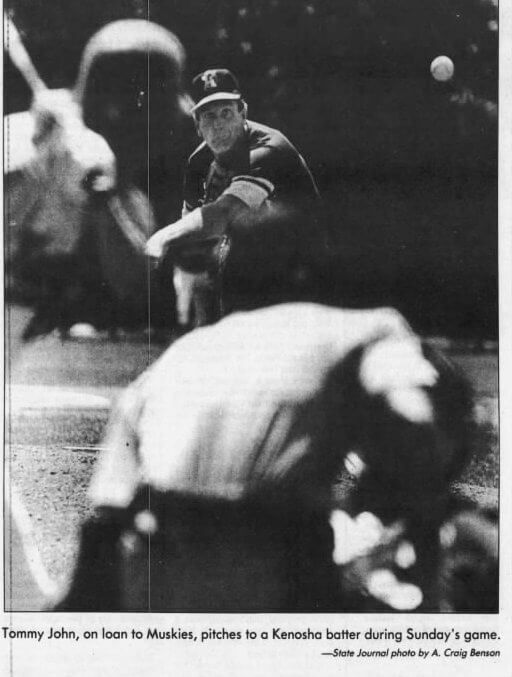 In 1985, Tommy John pitched one rehab start for the Muskies. Tom did not have an overwhelming year, batting . 209 in 234 at bats. Actually, if Tom had played in this era, Oakland’s GM, Billy Beane of Moneyball, would have liked his power, 8 homers, and .700 OBP with 44 walks and 11 HBP. That August and beyond, I was dating a fellow English graduate student, Debra Beilke. Debra was from Oshkosh, WI and when growing up sometimes attended Muskie’s games at picturesque Warner Field. One carefree August evening, Debra and I went Warner Park, that night swept by a hot summer breeze. Along with 2,616 other fans, we ate Wisconsin bratwurst and drank Leinenkugels and watched Tom pursue his field of dreams, a year or so removed (as was I) from Towers Field. According to Muskie’s Manager Dickie Scott, Tom had “turned it up a notch” and that night Tom crushed a two-run double into the 20 mph wind. 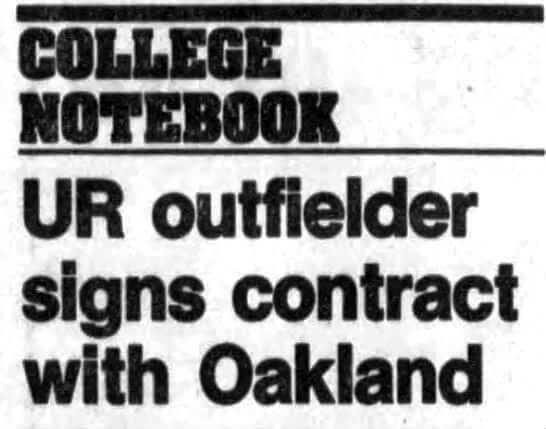 Wisconsin State Journal, August 2, 1992. After our time on the Madison isthmus between Lakes Minona and Mendota, I would go on to a PhD program at the University of Rhode Island while Tom — who had graduated from UR with honors in Economics — would hang up his cleats to pursue a successful business career. 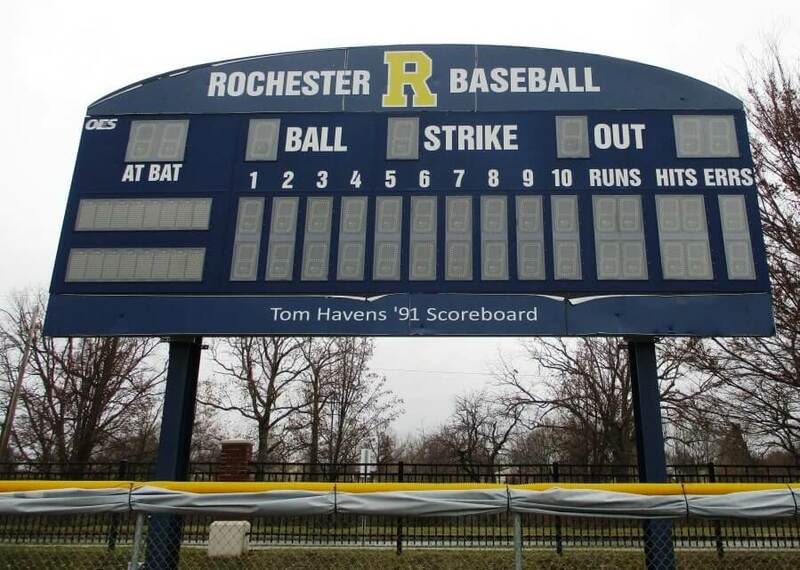 Later, Tom donated funds for the Tom Havens ’91 Towers Field scoreboard. 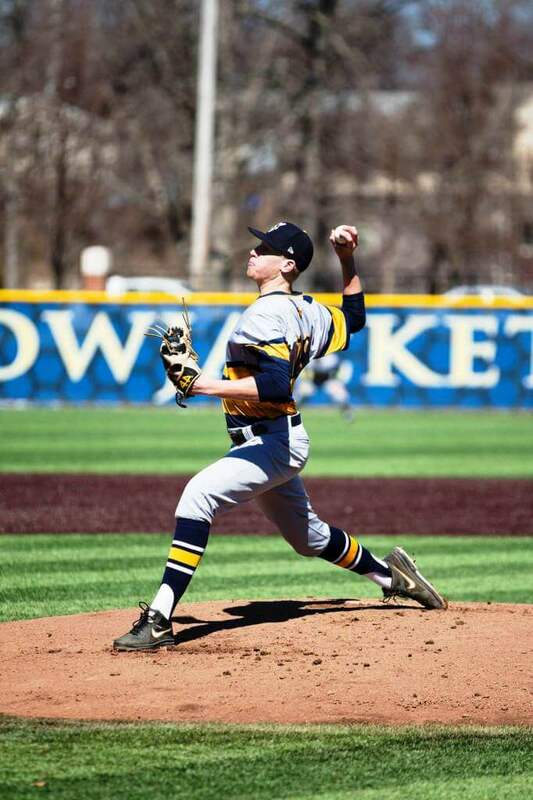 University of Rochester’s John Ghyzel pitching in his freshman season, 2015. Photo provided by Dennis O’Donnell, University of Rochester Director of Athletic Communications. 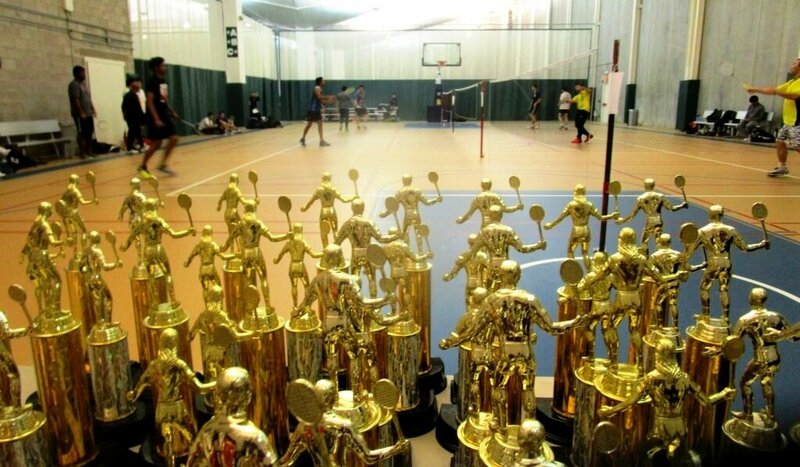 2016 Rochester Open a smash hit at the Robert B. Goergen Athletic Center. And the debut of ZOOM. University of Rochester’s Robert B. Goergen Athletic Center, 10/30/16. From 2016 Rochester Open a smash hit at the Robert B. Goergen Athletic Center. And the debut of ZOOM.